We offer superior quality rubber products that find their applications in assortment of industrial processes. Our wide range of rubber products includes viton gaskets, silicone gaskets, EPDM gaskets, manufactured from qualitative rubbers such as silicon rubber, vitton rubber and EPDM rubber. we are the leading Manufacturer of Plate Heat Exchanger Rubber Gasket in chennai. 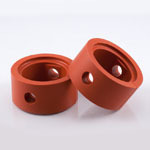 Looking for Rubber Products ?